FUN, FLAVORFUL TUTTI FRUTTI FISHIES - Nordic Omega-3 Fishies make it easier than ever for children to get the essential omega-3 nutrients they need. Kids will love the great taste and fun fish shape, parents will love the convenience. 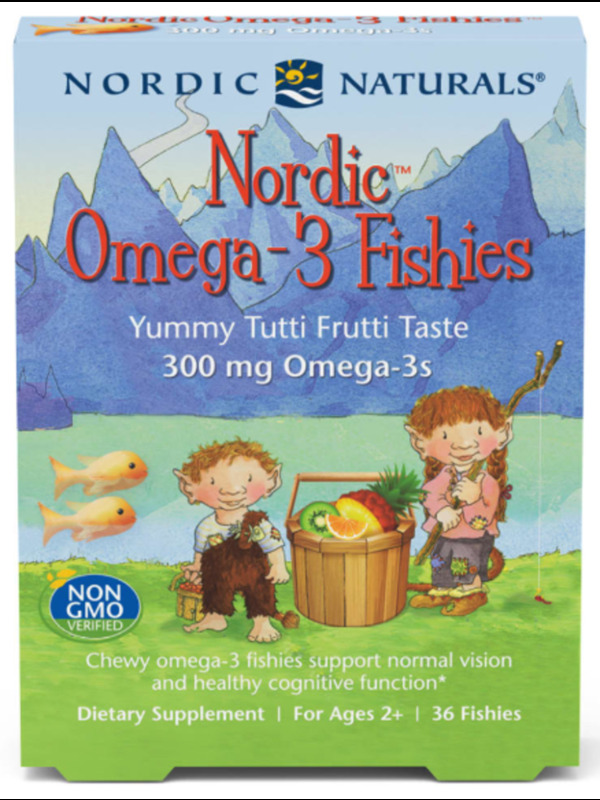 DHA and EPA help ensure adequate brain development in children and omega fatty acids can help prevent heart disease in adults. * All ages can benefit from increasing their omega-3 intake. 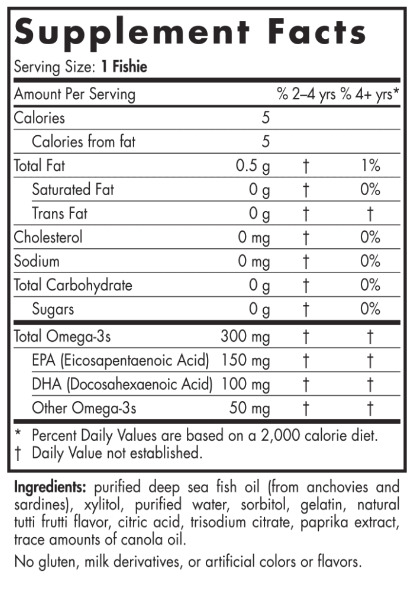 And what better way than an omega-3 gummy! 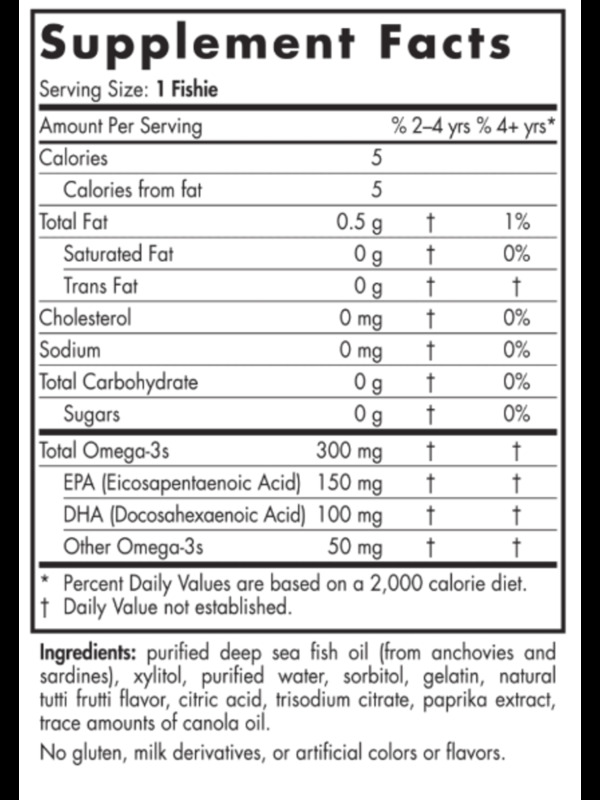 ONE DAILY FOR OMEGA SUPPORT - Getting omega 3 for kids couldn't be easier! 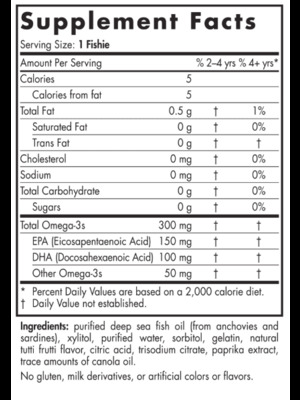 Just one delicious tutti frutti-flavored fishie provides 300 mg of omega-3s, including 150 mg of EPA and 100 mg of DHA. These easy, chewable omega 3 gummies are a kid favorite, and parents love that they are free of artificial coloring, flavoring and preservatives. Only one fishie needed for ages 2+. HELP THEM GROW - Give them the taste they love with the goodness they need to keep growing strong. Nordic Omega-3 Fishies help support healthy brain, eyes, and immune system function. * They are the perfect chewy supplement for toddlers to get their dose of DHA in a way they will love. PRODUCTS ARE NON GMO VERIFIED - Nordic Naturals has always been at the forefront of sustainable and ethical practices in the natural products industry. Since our founding, we have been committed to using only non-GMO ingredients. These are also gluten and dairy free, and use only sustainably sourced, natural ingredients to create a supplement without any fillers. ALPHA OF THE OMEGAS - At Nordic Naturals we believe that omega oils are essential to life. By correcting the global omega-3 deficiency, we give each generation what they need to grow healthy and strong. Through science and innovation, we are committed to delivering safe, effective omega oils. These gummies are the perfect addition to complete a supplement regimen or a great place to start adding supplements to your toddler or child's routine.